The airline industry has created a new type of experience for its passengers: These days your flight has an added visual component combining high fashion with aviation, all thanks to the high-fashion airline uniforms worn by in-flight personnel. 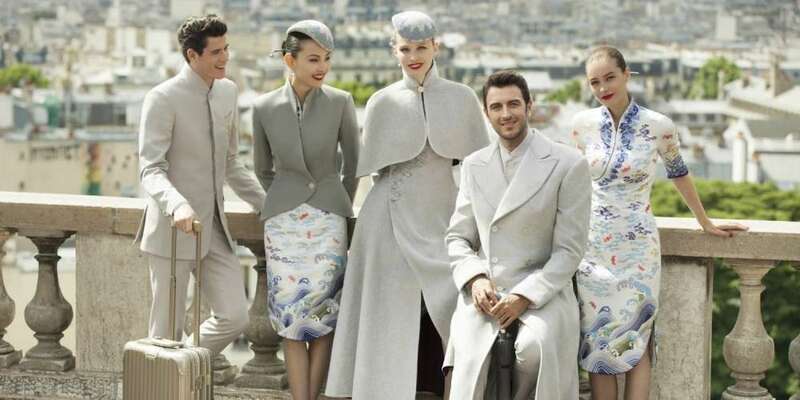 Hainan Airlines, one of the leading Chinese air carriers, debuted its new lineup of airline uniforms during the Paris Fall/Winter 2017 showcase. Collaborating with haute couture designer Laurence Xu, the airline showed off two stunning outfits during his runway show. Inspired by the classic Cheongsam — a traditional one-piece dress for Chinese women — Xu updated the style for Hainan. The men and women of Hainan got a major uniform upgrade. Gone are the blue-vest-and-peg-skirt combination in favor of a high-fashion cabin crew. Even the print on the uniforms tells a story, illustrating clouds around the collar with patterns alternating sea and mountains on the hem. The pattern is like staring out the plane from your window seat. The gentlemen’s uniforms also got a makeover, replacing the former navy blue vests and trousers with a more modern look. Now clad in fitted, light gray suits with Mandarin collars, the guys look chic while reminiscing a classic Giorgio Armani look. 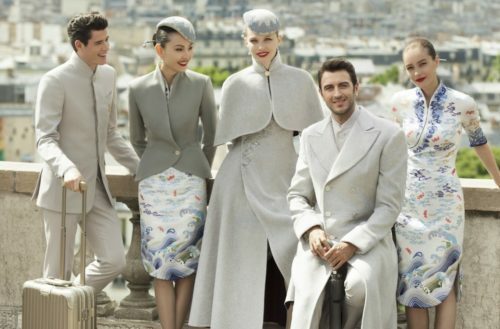 But Hainan isn’t the only company changing up its airline uniform game. Other carriers have also jumped on the opportunity, updating to more modern designs. Vueling, a Barcelona-based low-cost airline, also unveiled a new line of modern uniforms for its cabin crew. After collaborating with employees for over two years, the in-house design team created both functional and sophisticated looks for its staff. For the ladies, Vueling’s new uniforms consist of a higher waistline on its structured jacket. It gives an A-line shape on the body, flattering on all body types. The subtle slit on the peg skirt is youthful, the accent scarf (yellow for the cabin crew, grey for the pursers) more modern still. The guys look equally handsome in their newly fitted uniforms, particularly Vueling’s chic double-faced felt coat. The wool-blend fabric is comfortable, and the belted detail creates a flattering silhouette on the guys. Vueling’s cabin crew now looks like a million bucks. Designed by Italian designer Ettore Bilotta, the uniforms of Alitalia are beautifully tailored and reflect the art, culture and beauty of a country like Italy. Outfitted in green, red and white (referencing Italy’s flag), Alitalia’s uniforms use the finest fabrics like jacquard with overlapping colors to create a tone-on-tone effect. The ladies also get to accessorize with a hat, scarf and gorgeous handbag as part of the outfit. The men’s uniforms leans formal with an elegant Italian touch. China Airlines — Taiwan’s largest airline, based in Taipei — elevated its uniform game after tapping Oscar-nominated costume designer William Chang to update them. The new futuristic uniform design is part of the airline’s “NexGen” brand refresh. The men’s duotone block jackets are very fashion forward with Michael Kors and BOSS both featuring this look in recent catwalk shows, and the addition of a red accent on the lapel helps tie them back in with the female uniforms. Call it provocative or call it humorous, we love Lufthansa’s crew sporting Bavarian dirndl during Oktoberfest in Munich. Angermaier Trachten fashion house in Munich created the yellow, blue and white (Lufthansa’s signature colors) traditional folk costumes. Above, the female flight attendants model the classic bodice, skirt and apron during flight service, while the guys get to strut in port leather trousers and jacket with a waistcoat and tie. Lufthansa flight crews started this tradition more than 50 years ago. The custom went on hiatus until 2005, though, when the tradition of wearing folk costumes came back for a revival. You’ll find the Lufthansa crew sporting dirndl this year during Oktoberfest, Sept. 16 to Oct. 3. Cebu Pacific’s bright uniforms immediately put a smile on our face. To celebrate 20 years in business, the airline commissioned famed Filipino couturier Jun Escario to revamp its cabin crew’s daily outfits. Inspired by The Phillipines‘ azure skies and aquamarine waters, the new uniform consists of vibrant yellow tops contrasted against blue denim bottoms. The ladies also sport cardigans with vertical darts, and the ruffled denim skirt (with exposed zipper) is youthful and modern. Uniforms for the male cabin crew also reflect that aesthetic. A fun fact on Etihad Airways: Nicole Kidman was a spokesperson for its advertising campaign in 2015. The Abu Dhabi-based airline ditched its dull uniforms and elevated its look with brand-new outfits for the cabin crew in 2014. Designed by Ettore Bilotta, the same designer behind Alitalia’s uniform revamp, the redesigned clothes represented timeless sophistication and glamour. Bilotta created a brand-new palette for the airline, choosing warm chocolate brown as the unifying base and highlighting it with a dark purple for the cabin crew. Etihad’s male flight attendants sport grey, fitted three-piece suits accessorized with belts, leather gloves and a golden orange necktie. They also receive a lightweight, foldable trench coat for all types of weather. It’s a dramatic touch that recalls Out of Africa sophistication. Honored with the title of “The Best Airline In Mainland China” for several years running, Xiamen Air is another Chinese carrier offering a true visual experience to its customers. Based in Xiamen, Fujian province, Xiamen Air partnered with famous Taiwanese fashion designer Jamei Chen to design a line of uniforms reflecting a fresh, retro feel. The new male uniforms include sharply tailored silhouettes that date back to the ‘jet set’ era. With navy blue as the primary color palette, the guys look slick with a contemporary touch. They also sport Mandarin collar shirts and stylish black leather gloves. These Xiamen Air men not only look professional but personify coolness in the air.